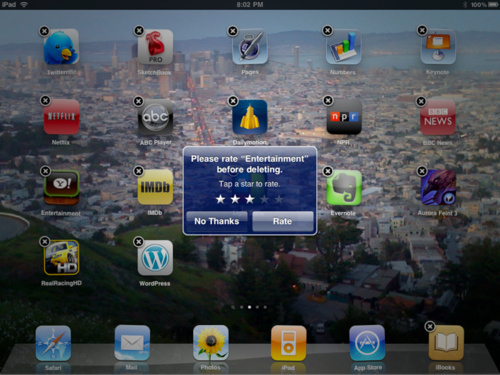 Originally the “rate on delete” prompt (shown in the image below) that users would get upon deleting an app was introduced in iPhone OS version 2.2 as a way of preventing people from rating apps they hadn’t actually downloaded and tried. In fact, around a year ago Apple removed a large number of ratings from users that had never downloaded the app they left a review or rating for. However, it would seem that feature actually had quite a negative effect on the ratings of many apps as the majority of people that delete an app are commonly not satisfied with the download. This would obviously skew the ratings and not give those that are actually enjoying the app the opportunity to give it a good rating. Its unclear whether or not there will be a new implementation of prompts for rating apps, but either way, you can say goodbye to the “rate on delete” feature. Do you think Apple needs to come up with a new way of prompting users to rate apps? Do the ratings of apps ever really effect your decision to make a purchase anyways?